Facebook suspended the personal profile of controversial InfoWars founder Alex Jones on Thursday, and removed four videos associated with his namesake page and that of InfoWars, a spokesperson for the social media company said. "We received reports related to four different videos on the Pages that Infowars and Alex Jones maintain on Facebook," the spokesperson said in a statement provided to CNN. "We reviewed the content against our Community Standards and determined that it violates. All four videos have been removed from Facebook." It was not immediately clear which videos Facebook removed, but the spokesperson said that the company's community standards "make it clear that we prohibit content that encourages physical harm [bullying], or attacks someone based on their religious affiliation or gender identity [hate speech]." Jones had previously been sent a notice that he had violated Facebook's policies and that his personal profile would be subject to a 30-day suspension the next time he did so, the spokesperson said. However, Jones' personal profile remains online, as do the InfoWars and Alex Jones pages. The Facebook spokesperson said the pages were "close" to meeting the unspecified threshold of violations that would result in Facebook unpublishing the pages, but that for now the pages had not crossed that line. Asked for comment, Jones responded in a statement sent through a representative after this article was initially published. In the statement, Jones accused CNN of publicly calling for the banning of his free speech and of being on a "campaign against competing news organizations and the First Amendment," which he called "outrageously anti-American." He demanded that CNN "cease and desist." CNN has not called for anyone to ban Jones or InfoWars from speaking, but has been reporting on social platforms' stance towards InfoWars, especially as those platforms claim to be combatting misinformation. 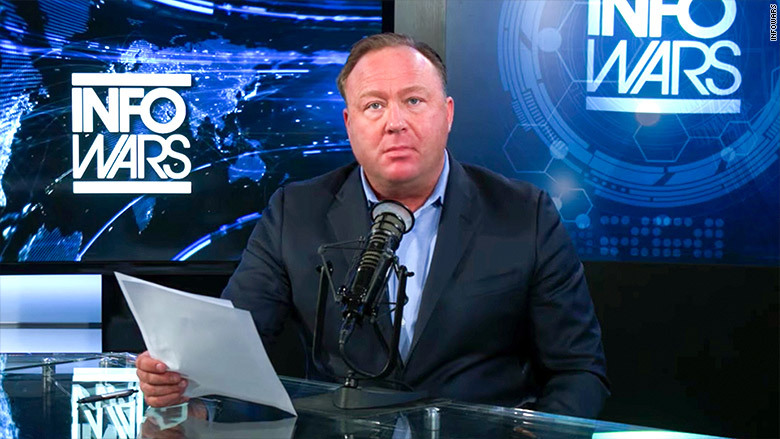 Facebook's action against InfoWars came one day after YouTube removed four videos posted by Jones. YouTube issued Jones a "strike," meaning he is unable to livestream content for three months. Last Wednesday, when Facebook CEO Mark Zuckerberg attempted to explain Facebook's position on the matter, he gave new fuel to the controversy by saying he did not know if Holocaust deniers intended to deceive others when sharing Holocaust-denying material. Zuckerberg later walked back his comments. Correction: This post has been updated to reflect that Alex Jones' personal profile was suspended for 30 days. Facebook's initial statement to CNN incorrectly suggested that the profile had only been given a notice warning of a possible future suspension.